This is a concern or question often asked by people looking to reduce their weight. If that’s what you are after you want to be sure you’re not just wasting your time or money. These bikes are the most comfortable method of exercise and they are low impact on the joints too. That comfort can make you think you won’t lose weight. After all, can you lose weight by sitting down reclining? How can you get an effective workout to burn calories? But it is possible to do get a workout that is as effective as you get on other stationary exercise bikes. In looking a how effective the weight loss is going to be with a recumbent exercise bike there are a few considerations to look at. There is a good and a bad to the padded seats, back rest and the reclining position of recumbent exercise bikes. The comfort can take your mind off exercising especially if watching TV at the same time. What can happen is you slow down pedaling due to the distraction and you don’t get the benefit you’re expecting or want. It is just something to be mindful of to ensure it doesn’t happen. The other side of the comfort is you can exercise for longer. Although the intensity might not be there but because of the extra time you can exercise due to less pain and better support overall you burn more calories while being entertained at the same time if you want. You can use slow cardio, more intense and interval training and also training in a certain heart rate zone on these bikes. Slow cardio is where you pedal at a slow comfortable rate. You can do this for a long period of time, as you might do watching TV. It is slow and doesn’t burn calories at a high rate. Heart Rate Zone is a percentage of your maximum heart rate (the maximum you can exercise). An estimate is made as being 220 less your age to determine this (easier than getting on a treadmill, hooked up to a monitor and having it measured). The supposed fat burning zone is between 55 – 75% which is where you burn more fat than at a higher rate. But you end up burning less calories than at a higher intensity so it’s not as effective as exercising at a higher percentage of maximum heart rate. But at a lower heart rate you may exercise for longer than you probably can at a more intense steady state cardio so you may actually burn more calories at the lower rate. Measuring your heart rate is therefore really good for giving you an indication of intensity but not necessary to make sure you’re training in a “fat zone”. The method that most people recommend for the most calories burned is HIIT where you exercise at very high intensity (about 90% of effort) for a short period and then have a recovery period and then start again. A famous method is tabata where you go as fast as you can for 20 seconds, then rest for 10 seconds and repeat for a total of 8 sessions. Or if a beginner you could reverse this ration and say exercise for hard for 30 seconds if beginner you probably should ask your doctor) and recover for 60 seconds. The big advantage of this type of exercise over and above the fact that lasts for a relative short time is what is called the afterburn effect (also known as excess post-exercise oxygen consumption, or EPOC.). You do burn less calories during that time then you would for a longer period at a slow steadier rate. But because of the afterburn effect you continue to burn calories and fat afterwards to recover from the effects of the intense period of exercise. It seems your body is working harder afterwards to recover for 24 to 38 hours resulting in burning more calories over that period and there is also a suppression of appetite too. If you don’t want to come up with your own intervals or workout plans there are bikes that have pre-set programs that can help you with these such as the Schwinn 270 or the Ironman Fitness X-Class 410 Recumbent Bike. They have various different workouts but include intervals as well as hill climbing. They also have heart rate monitoring which can help you assess how hard you’re working. It’s not as many as weight bearing exercise such as running or where you are exercising the whole body as you might do on a rower. But it is comparable with other forms of bike exercise equipment. It’s a little less because you don’t engage the core like you do on an upright or spin bike. But again it is more comfortable so you can workout for longer periods. As an estimate for calories burned a 150 lbs person training moderately which is at 50 – 70 % heart rate for say 30 minutes will burn through about 204 calories, a treadmill is 264 calories but with a lot more impact on the joints. As they say you can’t out exercise a bad diet. This goes for any form of exercise. To be effective your exercise needs to be combined with a good nutritious diet. A good diet is the most important part of any weight loss regime whatever method of exercising is performed. 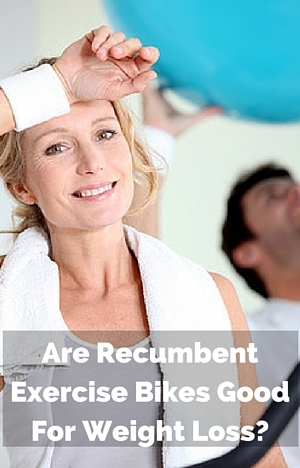 The actual recumbent exercise bike is not as important as actually doing the exercise. You can get good workouts for beginners on affordable bikes. They don’t include workout programs that you can follow along to so you do need to come up with your own. The more expensive bikes do come with pre-set programs with training to help with fat burning by adjusting the resistance over intervals as well as heart rate control programs to help to keep you in the heart rate zone considered best for weight loss. To speed up the effects of calorie burning you can get a recumbent exercise bike where you can also exercise you upper body at the same time. They have hand pedals on the front support. The comfort and low impact is the same but you get more calories burned. The best ones I’ve found can be seen here: Best recumbent exercise bikes with upper body workouts. Unfortunately the calories burned you see on a bike’s monitor are a calculation – not the actual calories burned. They can be use for comparing between exercise sessions but not relied on for calculating exact calories out. It gives an indication that’s all. The more affordable bikes don’t ask you for your weight but use an average weight. The more expensive ones do use your weight and your resistance as well as pace so do provide a closer estimate. You can get an effective workout with a recumbent exercise bike to help to burn calories and fat. There are customers that talk about losing weight, in their reviews and answering other peoples question, with the help of their recumbent exercise bikes. With their combination of comfort and low impact workouts can be a great way to help you lose weight when combined with a good nutritious diet. This is the same with any weight loss program- diet plays a very important part. You can use them for intense workouts or low intensity for longer time periods. You’ll burn calories but without the proper diet your results won’t be what you want to see. Heart range from 81 to 101 is this enough to benefit my heart and body? Hi, I think it’s best you speak to your doctor for this type of specific advice. I wouldn’t get too concerned about the calories burned – it’s great that you are exercising and go from there.